Built in 1943, by the Equitable Equipment Company of Madisonville, Louisiana (hull #192) as the F-18 for the United States Army. The vessel was originally constructed as a 104(ft) icebreaking freighter for the United States Army. In 1969, the vessel was acquired by the Smith Tug and Barge Company of Rainier, Oregon. She was extensively rebuilt, and converted for use as a tugboat. Where she was renamed as the Grizzly. In 1977, the Smith Tug and Barge Company was acquired by the Knappton Towboat Company of Astoria, Oregon. Where the tug retained her name. In 1984 the tug was transferred to the SeaCoast Transportation Company of Seattle, Washington. Which was a subsidiary of the Knappton Towboat Company of Astoria, Oregon. Where the tug retained her name. In 2004, the tug was acquired by the American Navigation Company of San Francisco, California. Where she retained her name. In 2005, the American Navigation Company was acquired by the Foss Maritime Company of Seattle, Washington. Where the company was branded as AmNAV Maritime Services of Oakland, California. And, the tug retained her name. 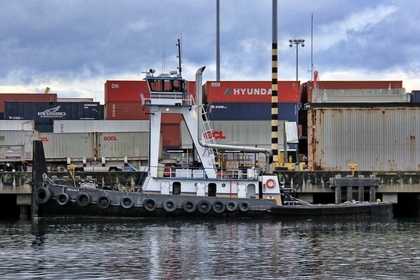 In 2007, she was acquired by Harley Marine Services of Seattle, Washington. Where the tug retained her name. Powered by two, Caterpillar 398 diesel engines. With Caterpillar 3192 reduction gears, at ratio of 5.31:1. Turning two, four bladed, fixed pitch, stainless steel propellers. For a rated 1,800 horsepower. Her electrical service is provided by two, 50kW Isuzu generator sets. The tug's capacities are 25,200 gallons of fuel, 3,000 gallons of water, and 500 gallons of lube oil. The towing equipment consists of two, Beebe push wire winches, mounted on her bow. Which are remotely controlled from the wheelhouse.